Here’s what’s up in the world of TV for Thursday, August 23. All times are Eastern. 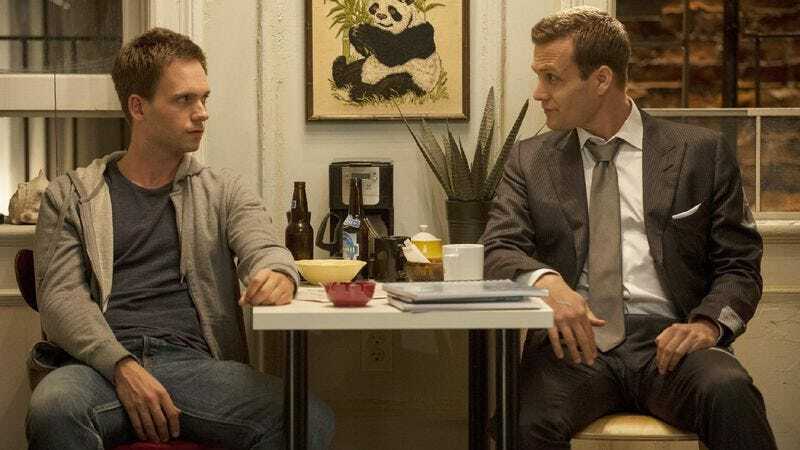 Suits (USA, 10 p.m.): This USA legal drama really hits its stride in its second season, building weekly cases around the battle for control of the Pearson Hardman law firm. A victor will be declared in tonight’s summer finale, and Carrie Raisler really, really hopes it provides a conclusion worthy of the episodes that came before—otherwise, her “No, seriously—Suits has gotten good, and not just ‘USA good’” argument is totally ruined. Project Runway (Lifetime, 9 p.m.): Don’t go changing—or awkwardly integrate a makeover show into the format—to try to please Margaret Eby, Project Runway. She loves you just the way you are. Burn Notice (USA, 9 p.m.): As reward for another half-season competently done, the Burn Notice gang heads to Panama. Scott Von Doviak hopes they bring him back a hat! Wilfred (FX, 10 p.m.): Wilfred and Ryan make a movie, which, if Wilfred has his way, will be a feline snuff film. Rowan Kaiser dreams of a day where no cats will die for the purposes of comedy. Louie (FX, 10:30 p.m.): Like the arthouse audiences of the 1990s, Louie goes looking for Parker Posey, but finds Chloë Sevigny instead. It’s a switcheroo worthy of a new turn of phrase from Nathan Rabin. Awkward. (MTV, 10:30 p.m.): The title of tonight’s episode, “Homewrecker Hamilton,” would make a good nom de piledriver, should Jenna grow up, find a time machine, and wrestle professional in the 1980s. Kevin McFarland’s grappling alter ego is “K-Fed,” because that’s his nickname now. Childrens Hospital (Cartoon Network, 12 a.m.): At last, an origin story for Megan Mullally’s Chief. David Sims takes extensive notes on details that will in no way be completely forgotten next week. NTSF: SD: SUV:: (Cartoon Network, 12:15 a.m.): Terror strikes on the weekend, when the NTSF team least expects it. If terror doesn’t mind, however, Kevin McFarland would like to sleep in. Monty Python’s Flying Circus (11 a.m.): Zack Handlen is proud to present Vivian Smith-Smythe-Smith, Nigel Incubator-Jones, and the other competitors in the 127th running of the Upper Class Twit Of The Year Show. Good luck with that wall of matchboxes, boys! American Bible Challenge (GSN, 8 p.m.): “The world’s most popular book comes to life” promise the ads for this game show. Given what we remember about the Old and New Testaments, that “coming to life” should involve a lot more plagues, smiting, and miracles—and a lot less Jeff Foxworthy. Beat The Chefs (GSN, 9 p.m.): The erstwhile “Game Show Network”’s second big première for the night also appeals to reg’lar folk, letting amateur cooks show up probably elitist, definitely more experienced pros in a big-money cook-off. Anger Management (FX, 9:30 p.m.): The sure-thing renewal of Charlie Sheen’s comeback vehicle looks surer than ever. To enjoy the first season finale of Anger Management, go into it with the mindset that maybe, just maybe, FX will decide at the last minute that it hates money and order a 90-episode revival of Terriers instead. The Beach (IFC, 8 p.m.): Danny Boyle sends Leonardo DiCaprio tripping through a psychological thriller that’s occasionally a video game and usually easier to follow than Boyle’s Summer Olympics Opening Ceremonies. An American In Paris (TCM, 10 p.m.): The Gene Kelly day of TCM’s “Summer Under The Stars” celebrates what would’ve been the soft-shoeing film-musical icon’s 100th birthday. Blow out the candles on his cake after singing a few George and Ira Gershwin ditties from the film that won Kelly the Academy Honorary Award. NFL Football: Exhibition: Cardinals at Titans (ESPN, 8 p.m.): Fun fact: The Arizona Cardinals have existed in one form or another since their founding in Chicago in 1898. Despite boasting two pre-Super Bowl NFL championships, they have never won the league’s biggest game. Unfortunately, winning this preseason game against Tennessee will get the team no closer to ending that drought. Abandoned: There’s no lack of people picking through and appraising other people’s stuff on cable—but only Abandoned does so exclusively in locations that have been, for one reason or another, abandoned. Les Chappel ain’t afraid of no abandoned buildings, or formulaic reality-show premières.